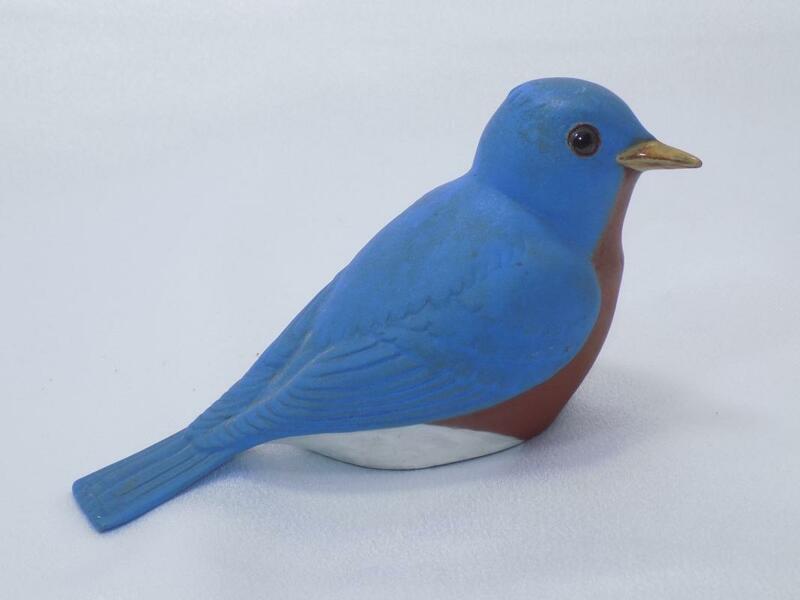 This charming pottery bluebird was made by acclaimed Ohio-born ceramics artist Chester Nicodemus (1901-1990). He studied under Arthur E. Baggs (founder of Marblehead Pottery) at Ohio State University and in 1932 he became dean of the Columbus Art School and President of the Columbus Art League. 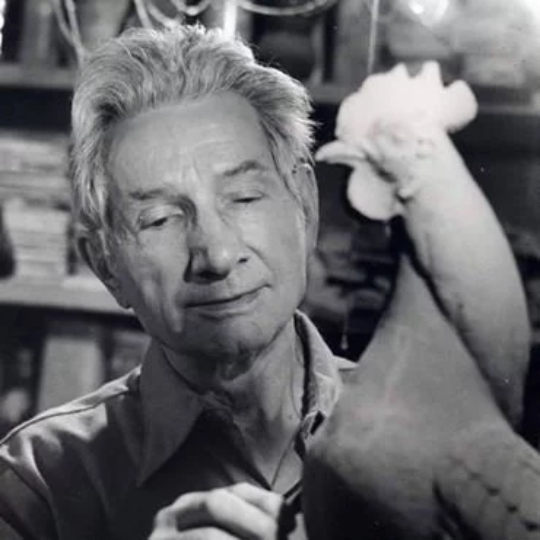 Having learned how to create clay castings, in 1941 Nicodemus established his own business in the Clintonville area of Columbus, naming it "Ferro-Stone Ceramics"--as in 'ferrous' for the iron content in the Ohio clay he used and 'stone' because the clay fired up so durable. He worked out of his home, selling locally and throughout the U.S. and never allowing 'seconds' to be sold. 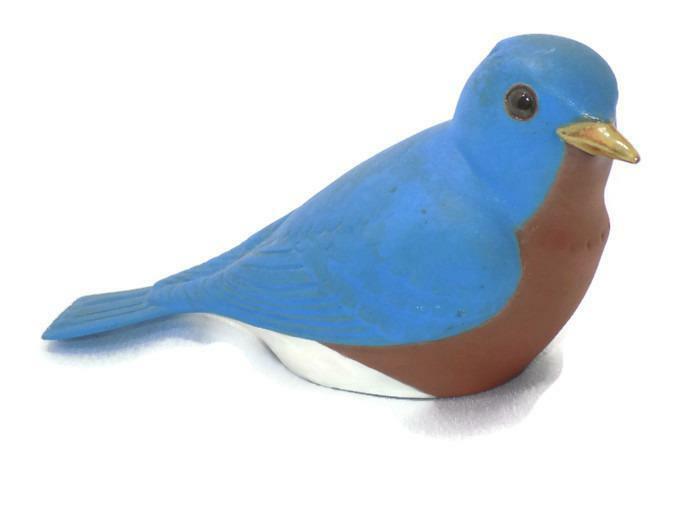 He designed most of his own equipment, over 600 molds and created all his own glaze recipes. Per his wishes, all of that was destroyed upon his death. We've included a photograph of Mr. Nicodemus, shown working on a much larger bird. 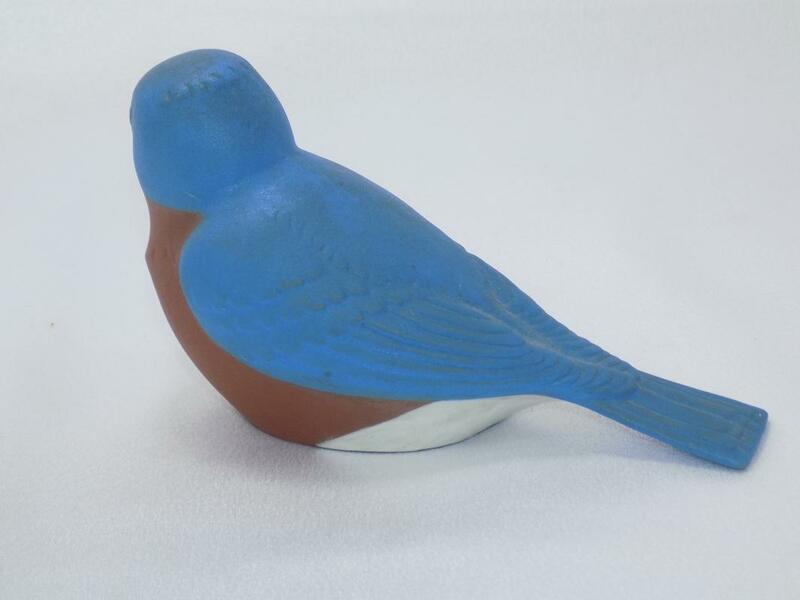 This bluebird is one of his several stylized bird models, all of which were hand painted. 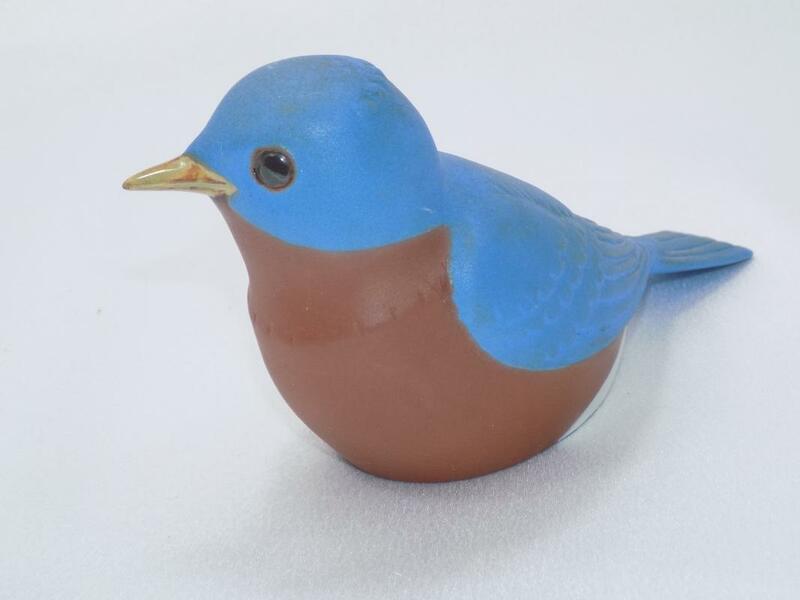 It measures 6 inches long, 3 1/4 inches tall and weighs about 6 ounces. 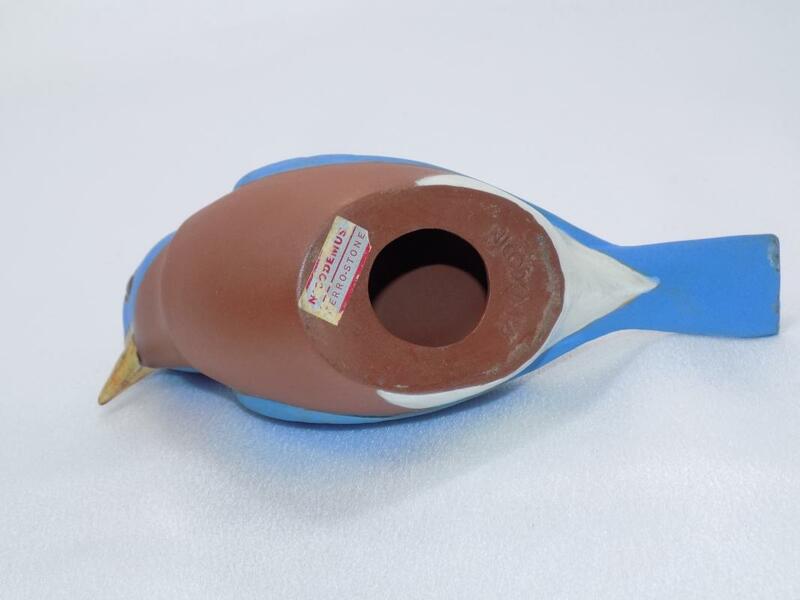 In outstanding condition, it is marked on the bottom with the impressed name "NICODEMUS" and also has its original paper label that has "Nicodemus Ferro-stone" printed in red. Since it does not bear the initials of either of his student/assistants, we're assuming he painted it himself. Chester Nicodemus pottery is prized today as art and is often equated with Roseville and Frankoma. 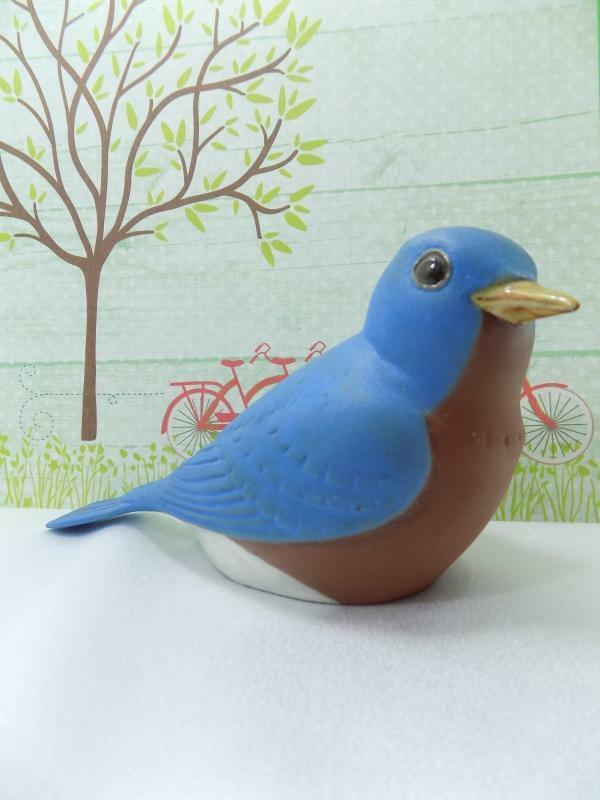 More and more collectors are discovering this talented artist's works.